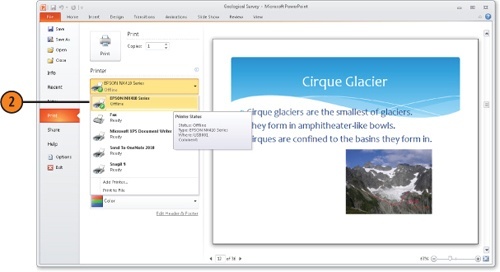 The PowerPoint print options include some settings that are probably familiar to you from word processor or spreadsheet programs and some that are specific to PowerPoint. For example, you can choose to print slides, the presentation outline, handouts, or notes pages. 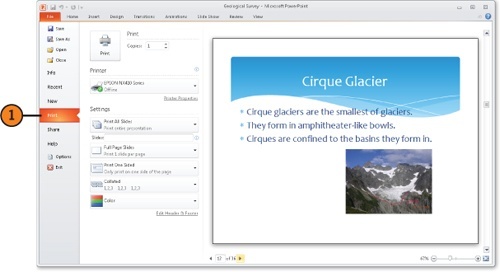 You can also choose how many slides to include on a single page if you are printing slides, handouts, or notes. If you haven’t used a Microsoft Office 2010 product before, however, you’ll find that print options are accessed a bit differently than in previous versions. Choose a printer from the Printer drop-down list. 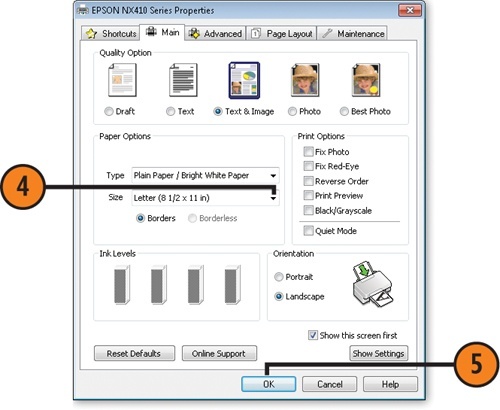 Set options available for your printer, such as changing the paper size or orientation. Click OK to save the settings and return to the Print Settings window. At this point, you can continue to change the settings as described in the next three tasks or click Print to print your presentation. Different printers offer different property options. For example, if you have a color printer, you can choose to print in color or grayscale. You might be able to select media type, such as printing to glossy paper or to transparencies for overhead projection. Take a look at your Printer Properties dialog box to see what settings are available to you. If you want the same printer to be the default option every time you print, go to the Windows Control Panel (Start, Control Panel, and then click the printers link), right-click a printer, and choose Set As Default Printer. You can still change the printer when you print an individual file, but that setting applies only to the document you are printing. Open Print settings from the File menu (see previous task). Print All Slides to print all the slides in the presentation. Print Current Slide to print only the currently displayed slide. Print Selection to print whatever contents you select prior to opening the Print settings. Selecting this option limits your navigation in Print Preview to just the selected slides. Custom Range to print a range or selection of slides. Enter slide numbers or a range (2, 15, or 3–15, for example). Click Print to print the specified slides. 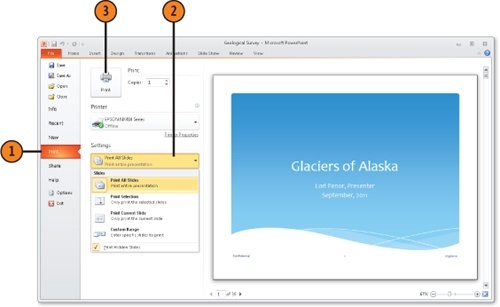 If you want to prepare a printed outline of your presentation in Microsoft Word rather than in PowerPoint, you can cut the outline from the PowerPoint Outline pane, paste it into Word, and then prepare the outline for printing from Word’s Print options.